We book private parties. 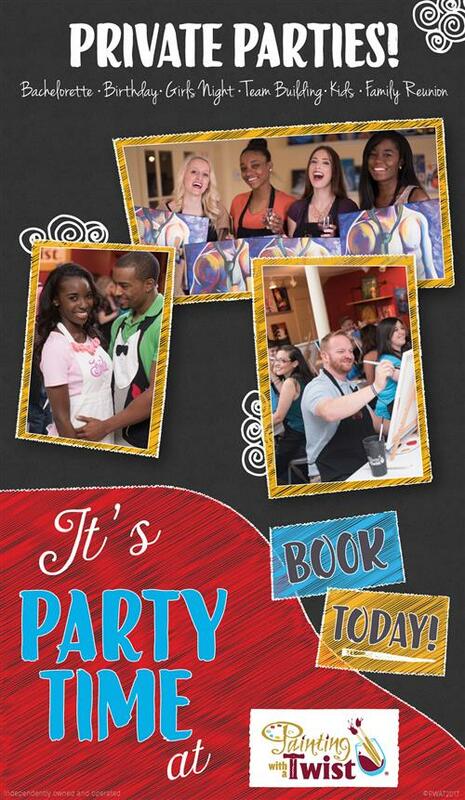 You will need to call us to reserve your room for a private party. We have two rooms available. Our main studio holds a maximum of 32 persons. Our smaller studio holds a maximum of 20 persons. We supply the paint, canvases, easels, brushes and aprons. You may bring your beverages of choice along with snacks or appetizers. We provide glasses for wine or other beverages, ice, ice buckets, napkins, small plates and cork screws. If you want to have a private party in our main room on a Friday or Saturday night after 6:00pm, we would need a guaranteed minimum of twenty (20) people secured by a credit card for our main studio. To use our smaller studio a guaranteed minimum of ten (10) persons secured by a credit card is required. A $100 cancellation fee will be charged if the party is canceled less than 7 days before its scheduled date or the difference between the guaranteed minimum and the number that attend is less than the guaranteed minimum. On a weeknight (Sunday-Thursday), the guaranteed minimum is ten (10) people secured by a credit card. A $100 cancellation fee will be charged if the party is canceled less than 7 days before its scheduled date or the difference between the guaranteed minimum and the number that attends is less than the guaranteed minimum. The cost is $35.00 per person for a two hour class and the cost is $45.00 per person for a three hour class. We allow a 30 minutes grace period at the end of the class – after that there will be a $50.00/half-hour charge for the room. You can choose your painting for the party from our extensive library of paintings. A Pass Word can be given to your guests so they can make their own reservation and pay online so you don't have to collect the class fees. Once a credit card is secured, we will send you a link to our Private Party Management Link. There you can view our gallery of paintings and choose your selection. After your selection is made you can use the Private Party Management Link to email or print invitations to send to your guests, and keep track of the guests who have reserved a seat for your party. Please call us regarding special pricing for children's parties. 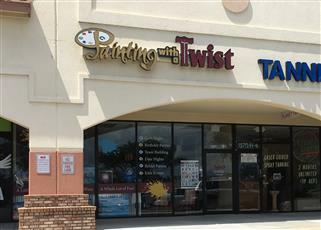 If you have any other questions, please call us at 727-797-7928 or email us at studio139@paintingwithatwist.com .